The taskforce report recommended the development of Cancer Alliances as the main vehicles for local service and accountability in cancer. The Cancer Alliance Board for Lancashire and South Cumbria includes representation from cancer commissioners, cancer service providers and patients. Working together through the membership of the Cancer Alliance, the aim is to improve the experience of cancer for the people in Lancashire & South Cumbria. 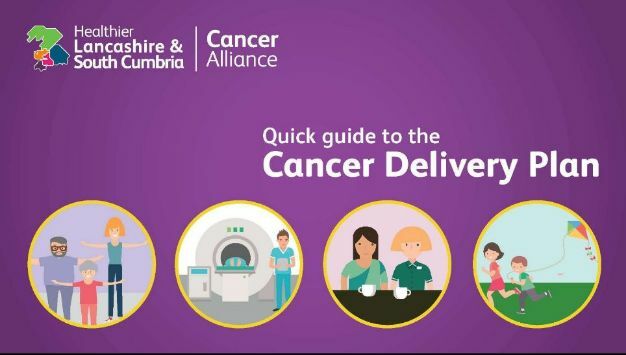 The Lancashire and South Cumbria Cancer Alliance has a delivery plan covering the period 2017-2019 which includes five workstreams designed to make its aims a reality. In the video below Cally Palmer, NHS England’s National Cancer Director shares her thoughts on the NHS Long Term Plan and what it means for Cancer.